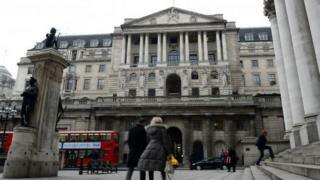 UK interest rates have been held at 0.5% once again by the Bank of England. All nine members of the Bank's Monetary Policy Committee (MPC) voted to keep rates at their record low, where they have now been for seven years. The decision to freeze rates comes amid worries about global growth and uncertainty ahead of the EU referendum. The Bank said uncertainty in the run-up to the referendum on EU membership - to be held on 23 June - had hit sterling, and that UK economic growth could slow. "There appears to be increased uncertainty surrounding the forthcoming referendum," policymakers said. "That uncertainty is likely to have been a significant driver of the decline in sterling. "It may also delay some spending decisions and depress growth of aggregate demand in the near term." Bank governor Mark Carney recently highlighted some benefits of the UK's EU membership, but said the Bank would not comment on the long-term implications of an exit. Chris Williamson, chief economist at financial information firm Markit, said the rate decision was "no surprise". He added: "The Bank highlighted how uncertainty regarding the June vote on the UK's membership of the EU is exacerbating wider concerns about the domestic and global economic outlook. "Policymakers noted how spending by businesses and overall demand in the economy could weaken as a result of the intensifying Brexit fears, which would worsen an already shaky start to the year." Once again the Bank said that interest rates were more likely to rise than not over the coming two years, and that any rises would be gradual. Martin Beck, senior economic advisor to the EY ITEM Club, said: "The prospect of a hike in the bank rate remains one for the dim and distant future." He said that Chancellor George Osborne's Budget plans "implied a slightly more severe fiscal squeeze over the next five years than previously planned, which should further caution the MPC against a tighter policy". David Kern, BCC Chief Economist, said the decision to keep interest rates and its QE programme on hold was "unsurprising" given the downgrading of the OBR's UK growth forecast in the Budget..
"The OBR's downgraded UK inflation forecasts, and the fact that the bank's own 2% inflation target is unlikely to be reached until late 2017 at the earliest, mean that a rise in interest rates is now likely to remain off the table for the foreseeable future," he said. "While inflation and rates remain low, the government's priority must be on creating a stable business environment to support growth, and making it easier for SMEs, particularly exporters, to obtain finance on competitive terms."